Residents are at the end of their tether with the chaos caused by motorists parking their cars inconsiderately to pick their children up from school in Long Lawford. Townsend Lane goes from a quiet village road to traffic congested every weekday from 2.30-3.30pm when kids leave Long Lawford Primary School, with cars double parked and buses unable to get past. One neighbour, who wished to remain anonymous, said he regularly gets told to move his car as it is parked on the different side from where the parents leave their cars. “It’s the people on the other side of the road that’s the problem. I’ve had mirrors knocked off my car because of vehicles unable to get past,” he said. Residents say it has always been an issue but over the past 12 months it has been particularly bad. Cars park leaving not enough room for two cars to pass and when the bus comes it often struggles to squeeze past. 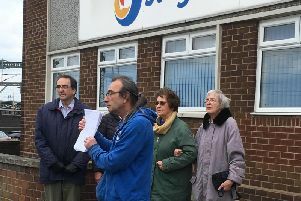 Stagecoach operations manager Ian Campbell recently met residents at 3pm to see the issues for himself, and witnessed a bus having to wait for a car to move. He said this is not a rare occurrence and sometimes the police have to be called to get vehicles out of the way. Mr Campbell said he would be lobbying Warwickshire County Council to get the problem addressed. “All our neighbours are fed up with it. The whole road is fed up, it’s getting beyond a joke,” one resident said. A Long Lawford Primary School spokesman said: “Having recently joined Long Lawford Primary School as head teacher, Miss Murphy has been made aware of the concerns about parking near the school. She has spent time gathering information, consulting with parents and governors and working with the community to try to formulate a strategic and co-ordinated approach to the issue. A Stagecoach spokesman said: “It is clearly recognised that there is a growing problem with parking and congestion around Long Lawford Primary School. “Inconsiderate parking is having a direct impact on maintaining the level of service we set out to deliver for our passengers. “We are working closely with the police, Warwickshire County Council and other agencies to address the situation.